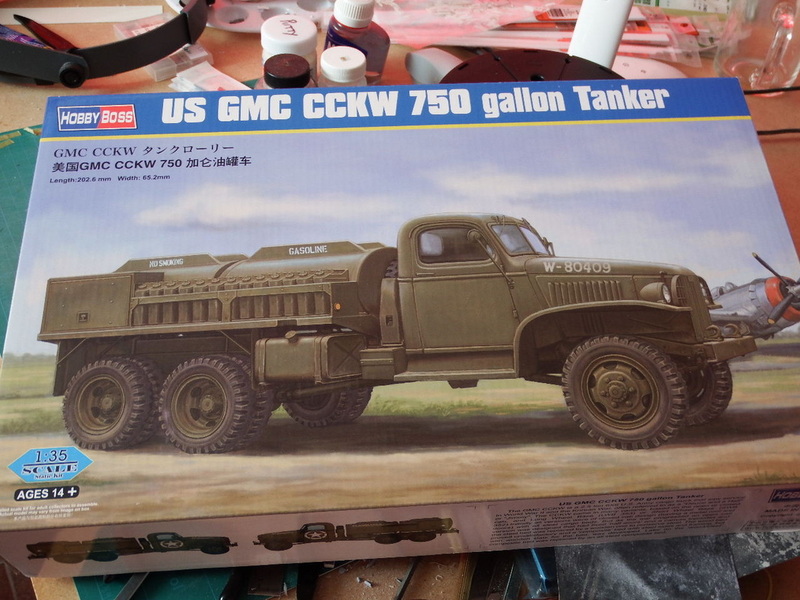 HobbyBoss had announced a range of 2.5 ton GMC Trucks last year and here is their first offering. 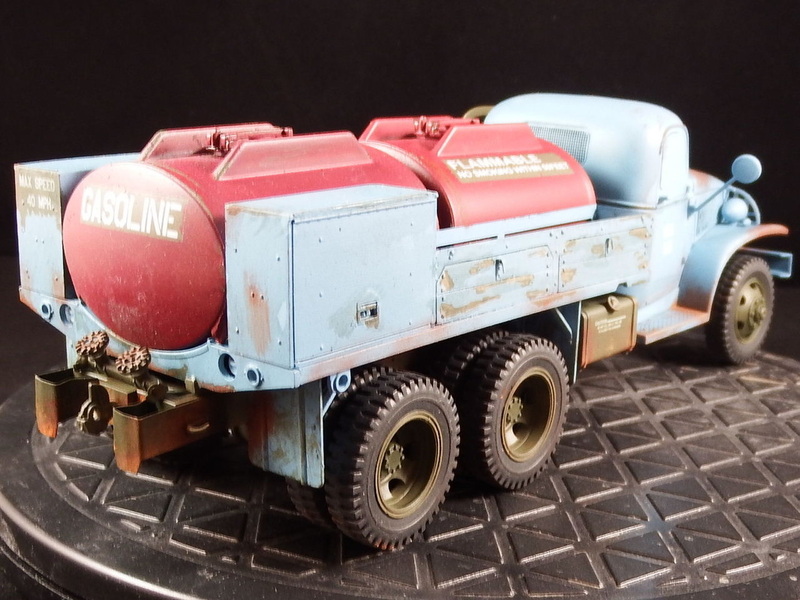 The 750 gallon Tanker in the twin cell configuration. 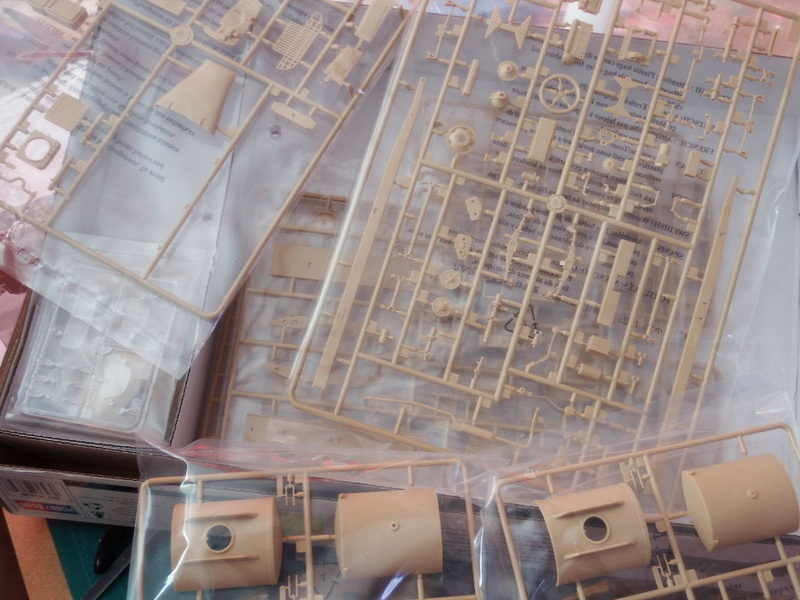 A large selection of parts in provide for 20 Plastic Sprues, 1 PE, 1 Transparency, some Poly Caps, the Cab some string & wire. Other than the obvious attachment points, there is no discernible clean up required. 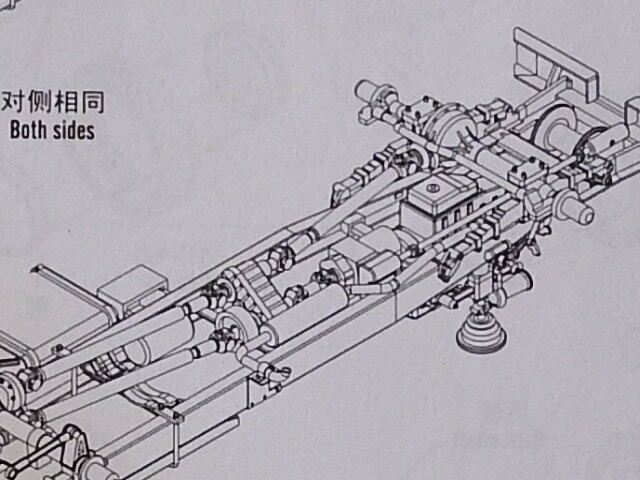 Other than any wires you may wish to add, this is very detailed. 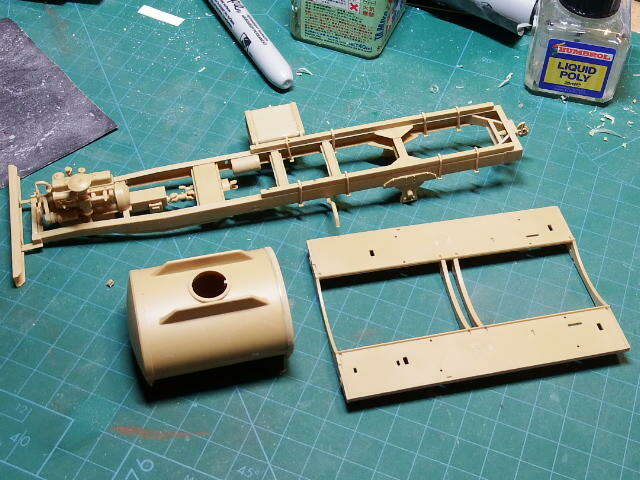 Still in Step 1, the main chassis construction comes next. 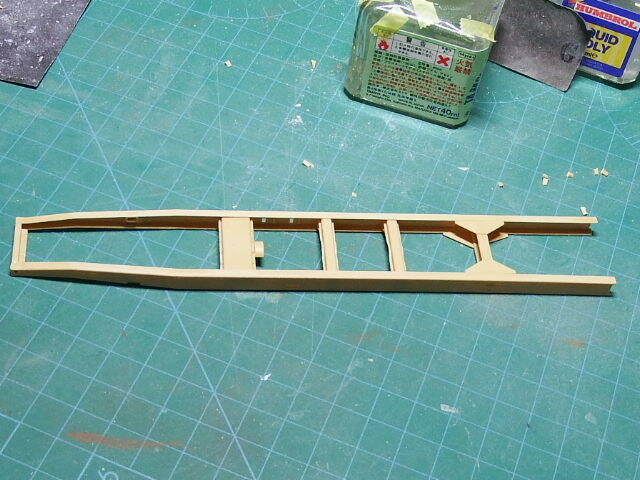 This is 17 parts and makes for a rigid and stable framework. 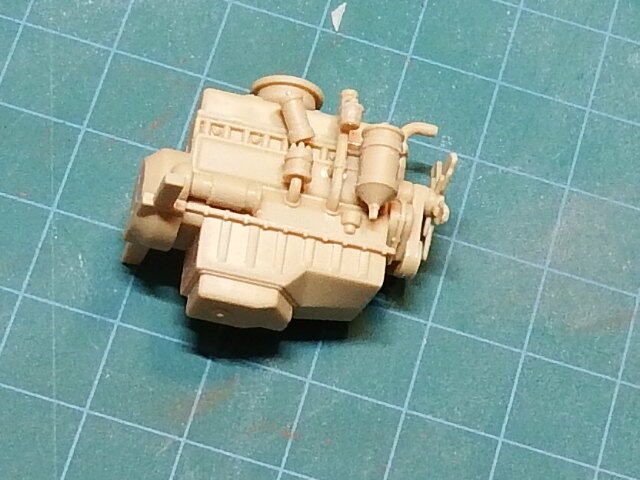 The addition of the engine at this point seals the frame and here I have added parts C20 (rear axle mounts). 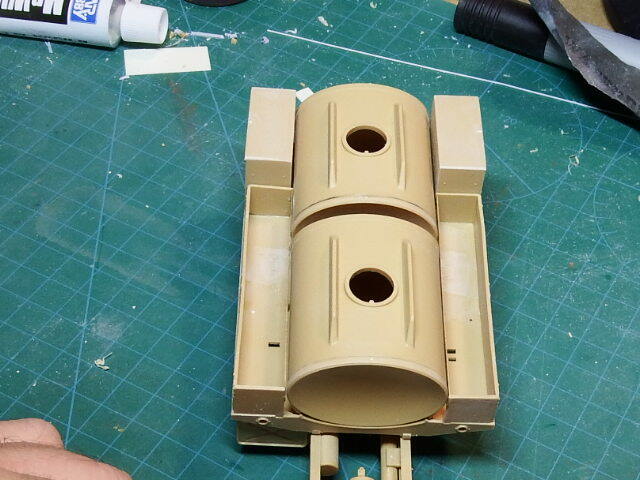 Step 2: comes the transfer box and exhaust. Also, at this point you must decide if you will be adding the cable mount. (I chose not to on this build). 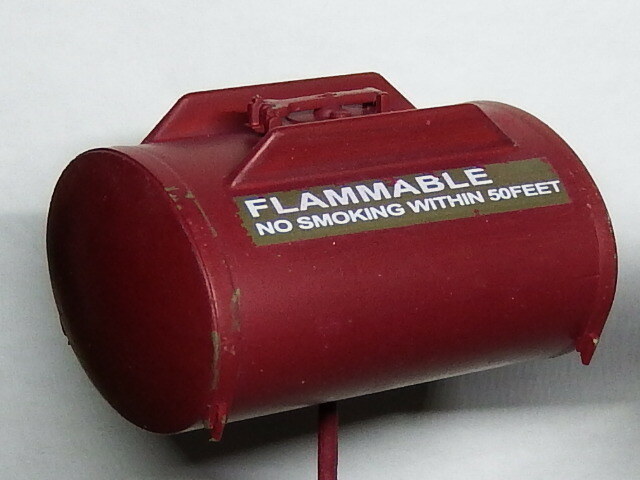 Note: the location of the exhaust as shown in the instructions shows a much shorter tubing either side of the silencer box and it is, on checking, incorrect for this version. 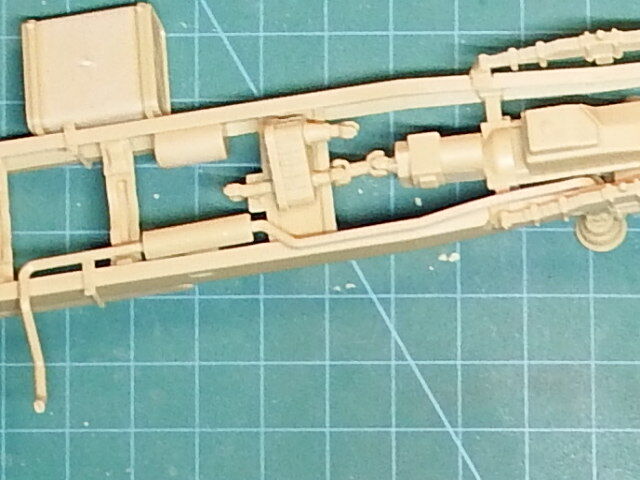 When assembling the exhaust, (unlike the instructions) the supplied kit parts are correct. 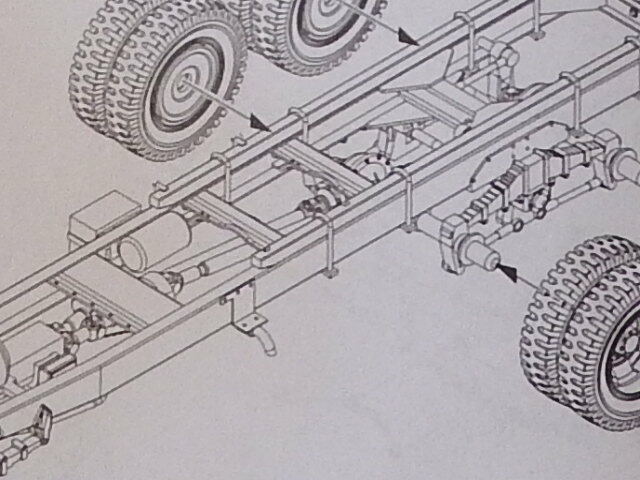 Incidentally, the large vehicle fuel tank seen at the start of Step 4 is shown as part M12 whereas it comprises parts M1 &M2 (the ends) and M12, the centre section along with M10, the filler cap. This image shows the incorrect placement so, DO NOT CUT BEFORE YOU CHECK! 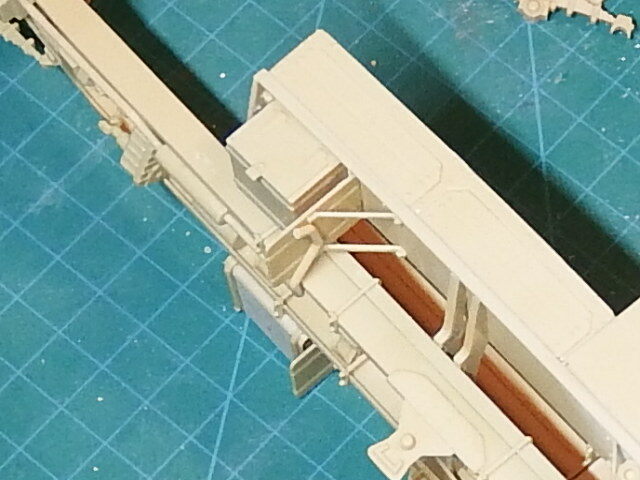 Step 3: has the risers for the cargo deck to be fitted and the restraining brackets. 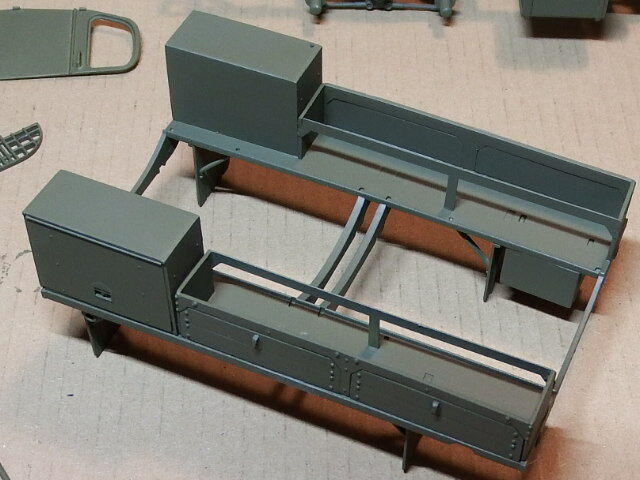 The cargo deck is more of a framework comprising 6 pieces, and each fuel tank, including hatch, are 5 parts each and go together very well. 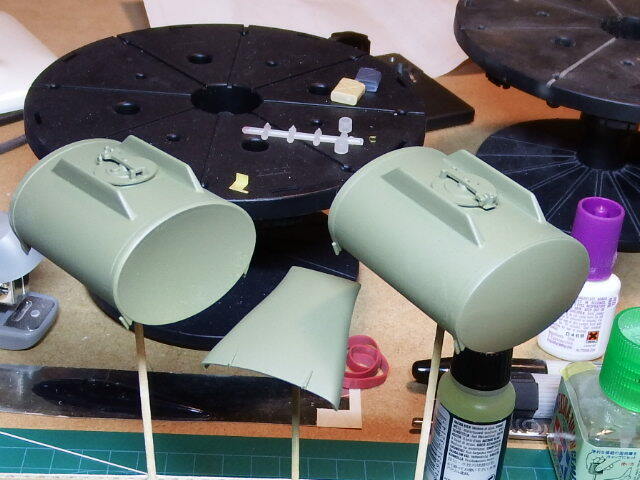 A small amount of sanding is needed on the Fuel Tanks around the seams. 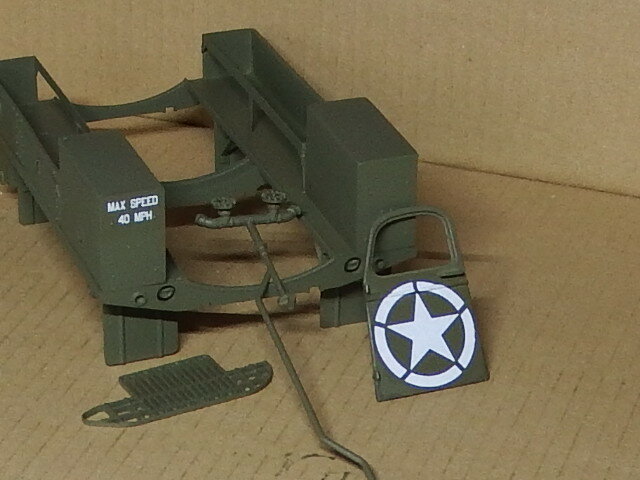 The tanks seat very well onto the chassis frame. Here is a test fit of the build so far! It's looking OK at present. The cab has a certain amount of springiness to it which will make things 'interesting' to say the least. 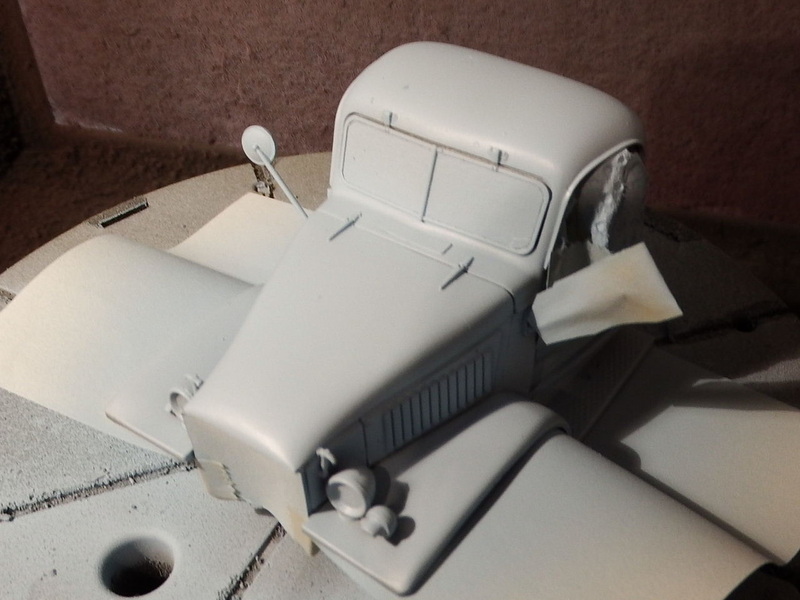 The cab and bonnet area will be the more 'challenging' part of the build as I have to construct the interior, paint it, then continue with the rest - should be 'fun'! Yer know what! I didn't do the painting yet. 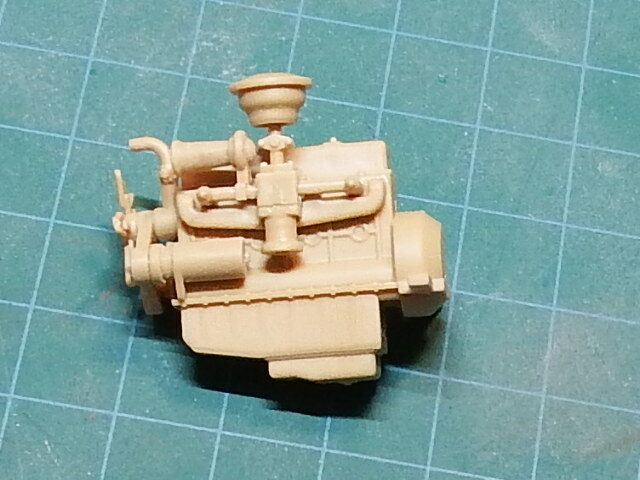 I decided to carry on with the kit and have finished building up the engine sides and bonnet and now I know it all fits. It actually looks really good! 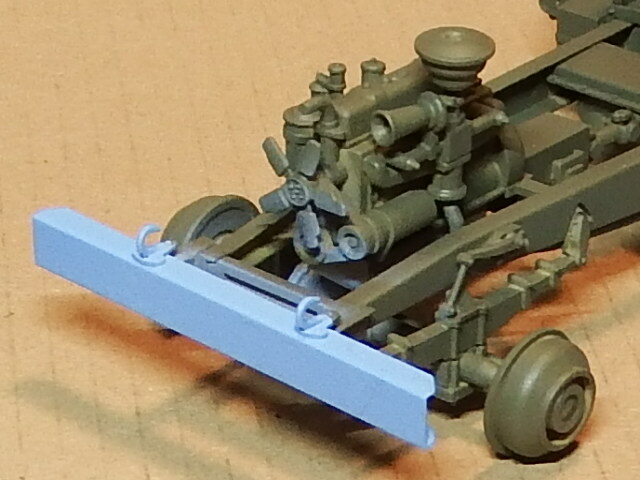 (The outside rear set of wheels are not fitted due to painting). And here's the other side. I haven't decided whether or not I'm going to have the drivers door open yet. Got to check what figure I have, and if they'll fit of course. 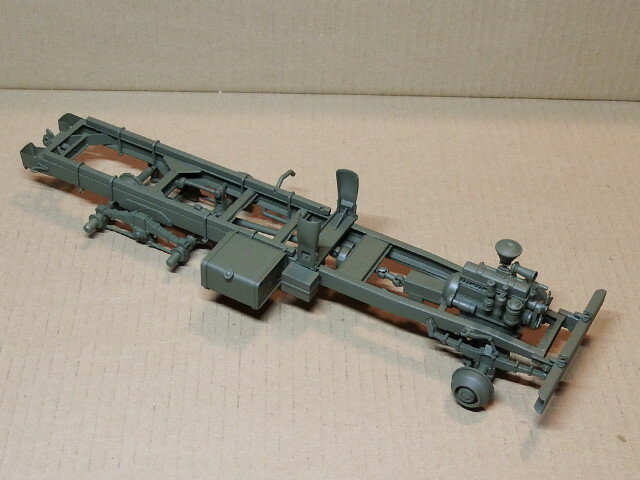 (All the sub-assemblies are still not glued together). Nothing much for a picture to see this trip, I have added the Tow Hooks, Head & Tail Lights (without the glasings), Door Handles - inside and out, Engine Bay Frame and Spare Wheel Bracket. As you can see from this picture, the US Jerry cans are somewhat different. When is a Jerry Can Not! 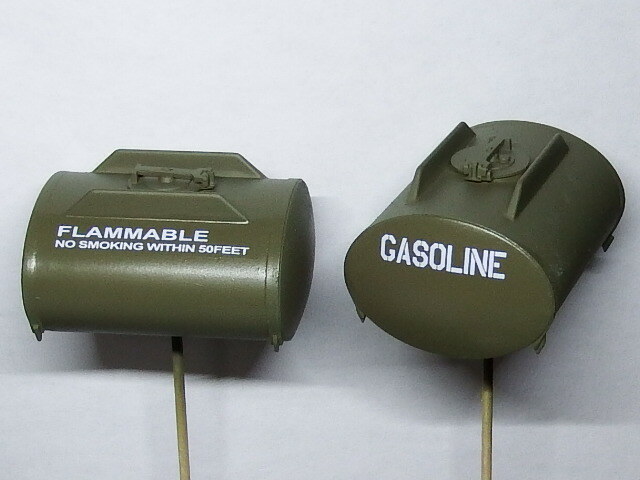 The dimensions and based on the conversion from a real WWII pattern US 5 gallon Fuel/Water can into millimeters and then converted into 1/35th scale. 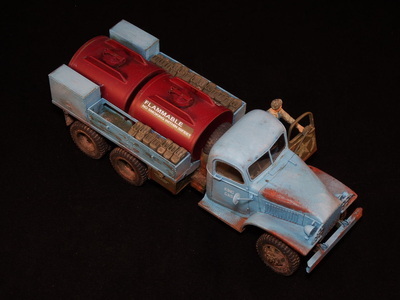 The HobbyBoss can is at least 10% larger than the Italeri one, and although it isn't completely accurate, it is noticeably closer to the correct dimensions. Make of that what you will! Preparation is the key. Now, I know that this looks rough but that's OK. 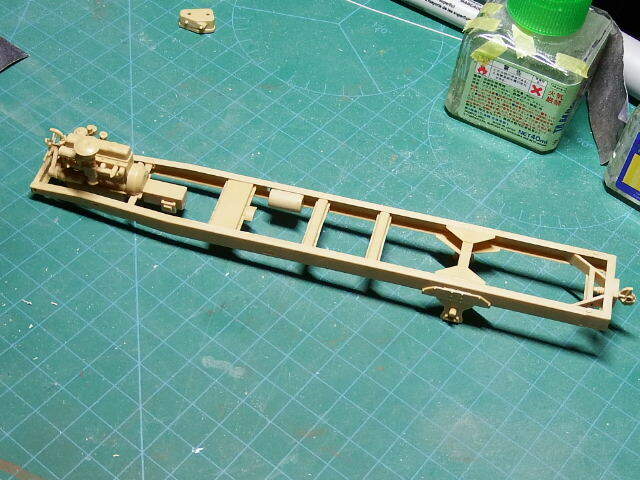 It's only a wood effect for later in the paint scheme. 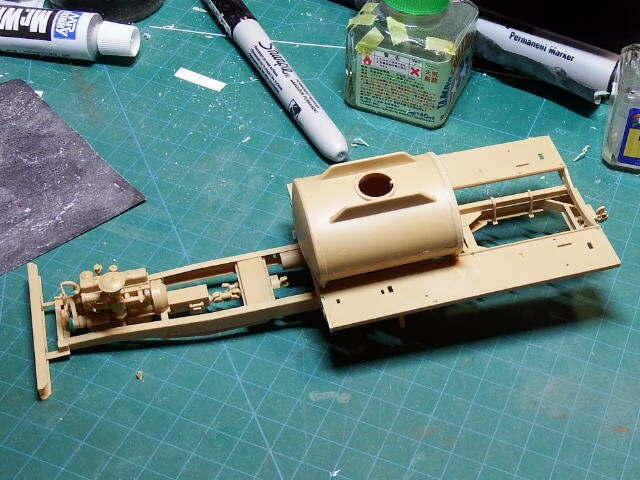 This looks a lot different now with a coat of surface primer. It also looks more business-like as well. Now the cab has been sprayed and it's dry, the paint finish is outstanding. 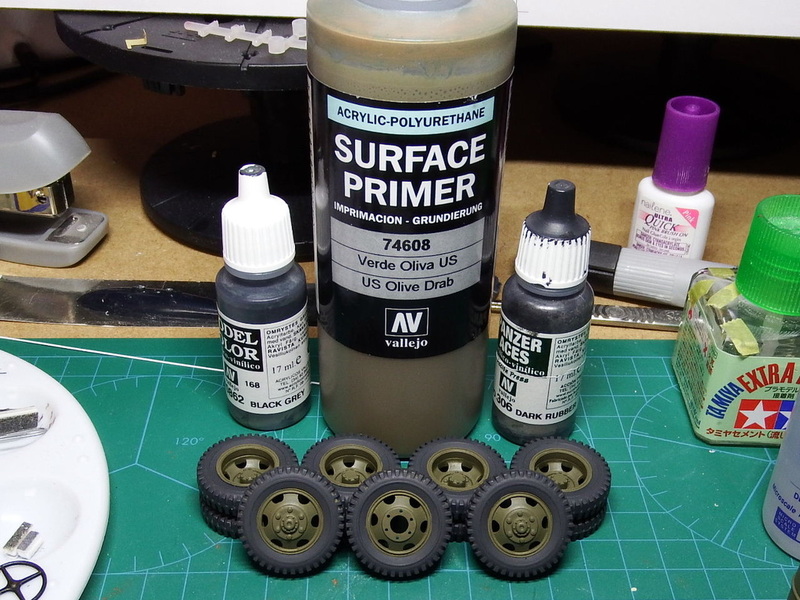 I am very impressed with this paint product. 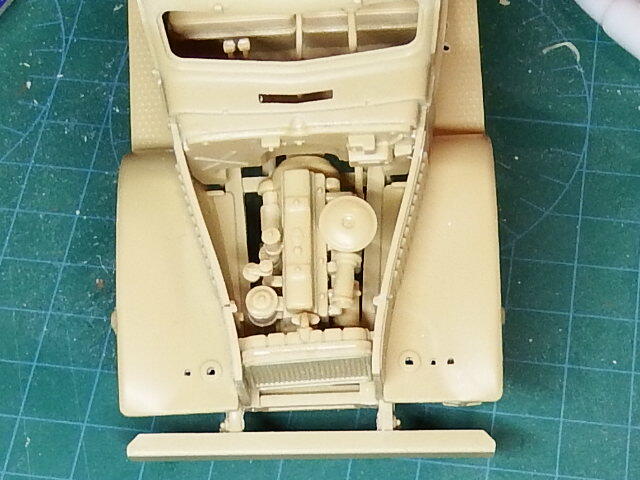 The chassis took a bit longer with all its nooks and crannies but the finish more than makes up for the time. I fealt at times as if I was a contortionist. 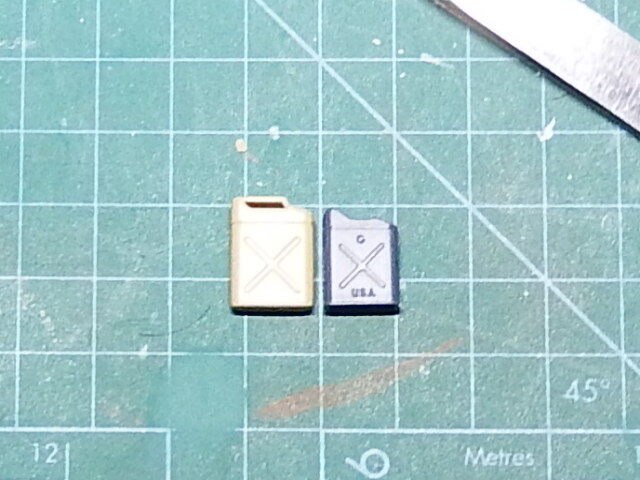 Here are the Bonnet (Hood) and Fuel Tanks. I know, but it is the same green (well, Olive) - slightly different lighting here but, still a cracking paint finish nonetheless. At this point, perhaps I should explain. 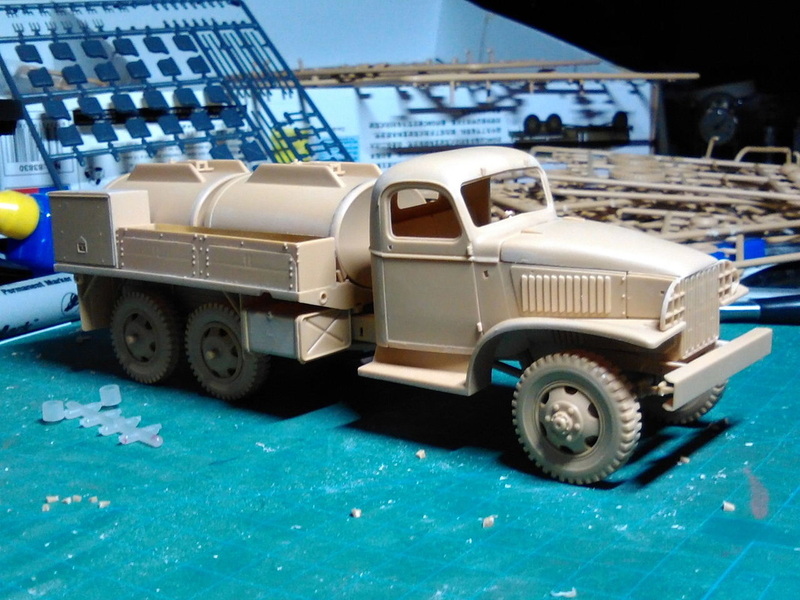 I am going to be doing a post-war re-tread in civilian service so their will be elements of both Military & Civilian in this build. 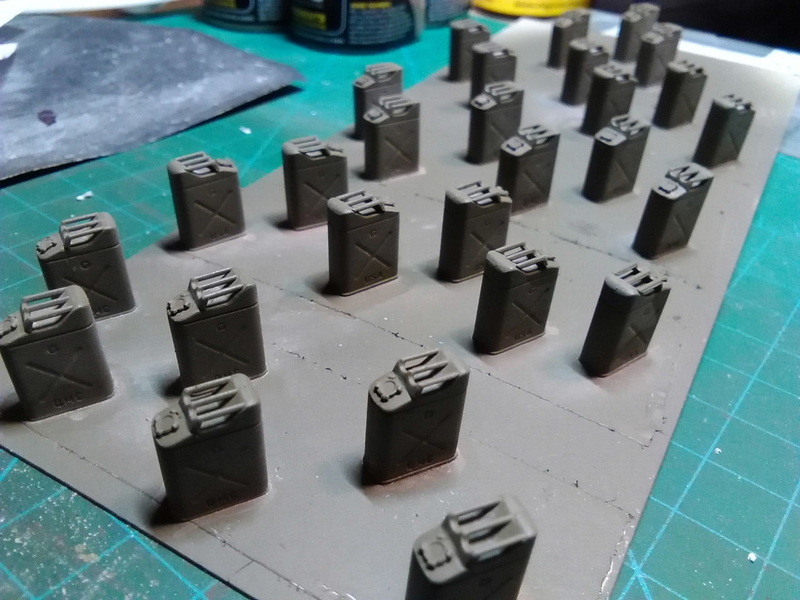 Some of the Military markings will be retained but some civilian ones (haven't sorted those out yet) will be added.This is where the fun starts! The windows have been masked off for the next stage of painting - the civilianisation process! What colour do you think it should be then? There has been a great disaster! The idea was that they should be Red. The first coat turned them Blackcurrant, the second Raspberry but! now they're dry - I like it!! There were a few speckles and blemishes but a quick whisk across with some old wet & dry and micro-mesh and the issue was resolved. 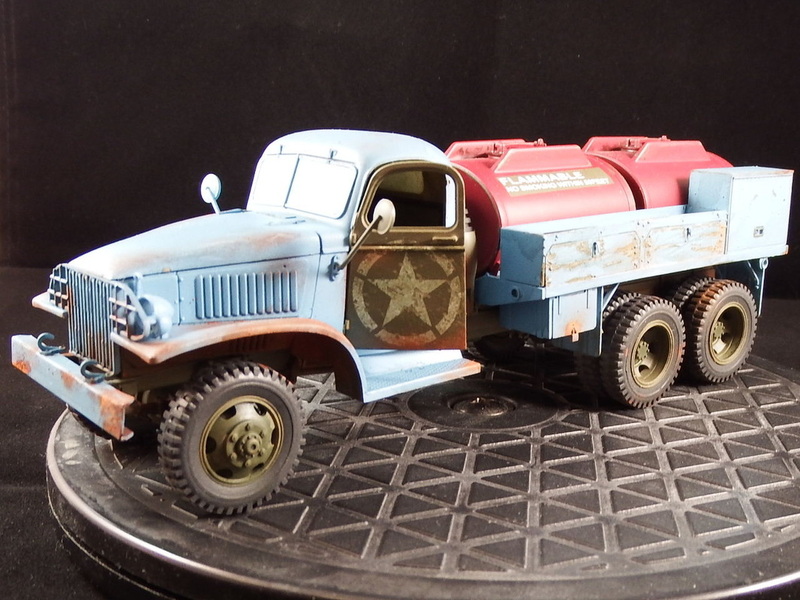 Whilst sanding, some of the red came off so I have touched up the areas with Olive Drab to give a weathered effect. Now for some varnish - Satin I think! 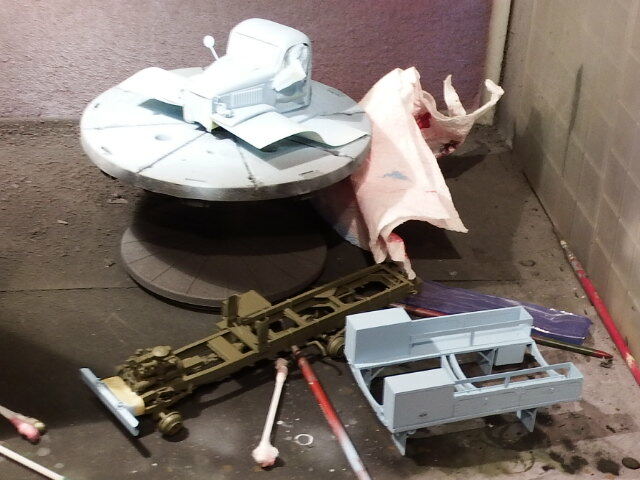 A bit more spraying today with a very light blue undercoat. 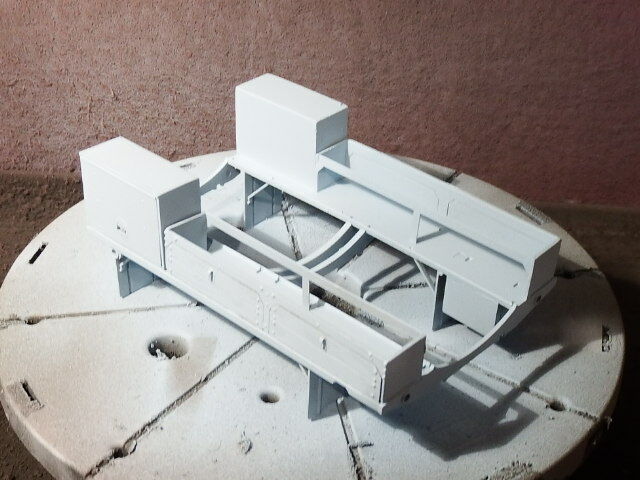 A mix of Model Air White with spots of Panzer Aces 309 Periscope - I winged it! 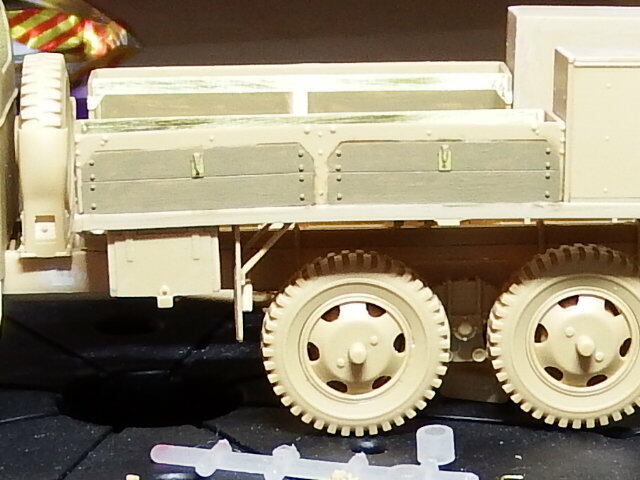 I have applied some chipping solution to the truck bed (another test piece for me) and we shall see later how this turns out. The paint needs to dry more first. 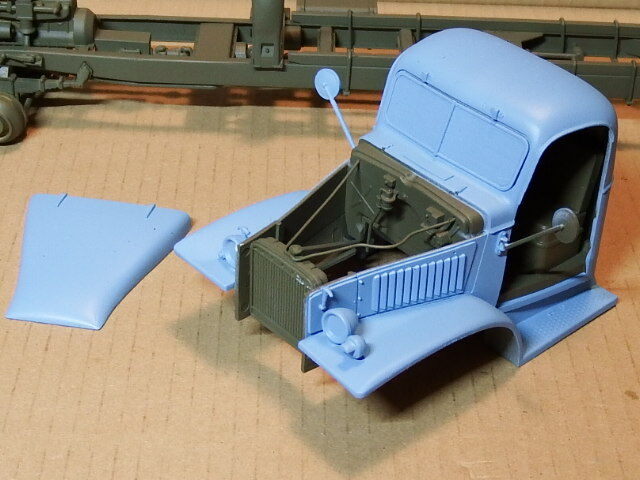 It took a while to safely mask off the cab, especially the open door area. But, coverage is excellent and there was no need to thin the paint. 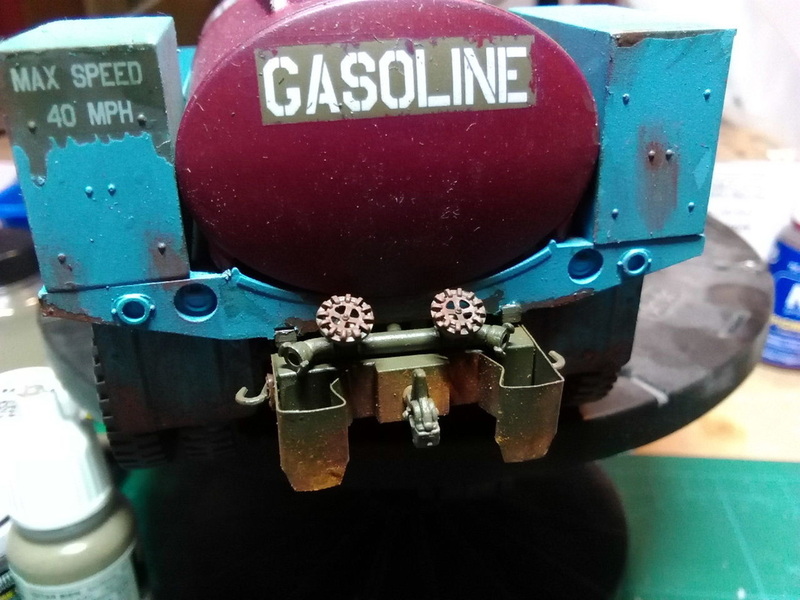 After adding more Periscope Blue to the mix I resprayed the parts with this darker Blue - which is really good shade, and with none of the issues I had with the Red on the Fuel Tanks. The truck bed will be distressed later. 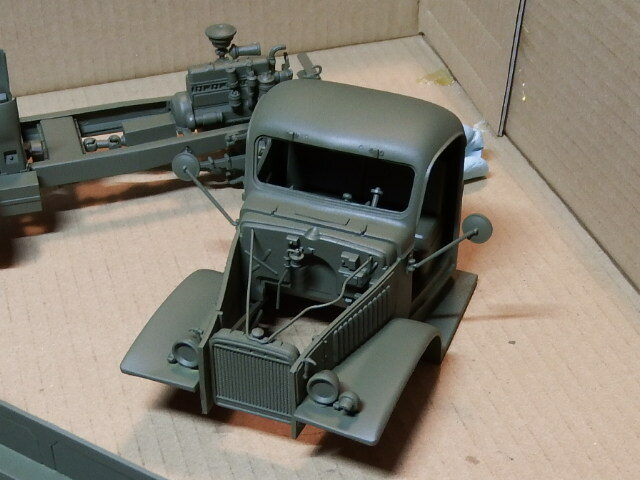 Although I had decided that the main chassis would remain in the Army Olive I decided that the front bumper would have been repainted so I masked off the part. You can see some over spray which I will deal with next. 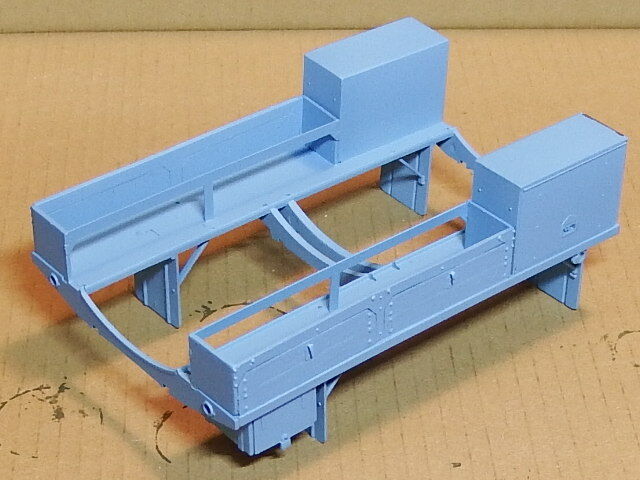 I have removed the bonnet and door filler so you can see the contrast in colours a bit better. 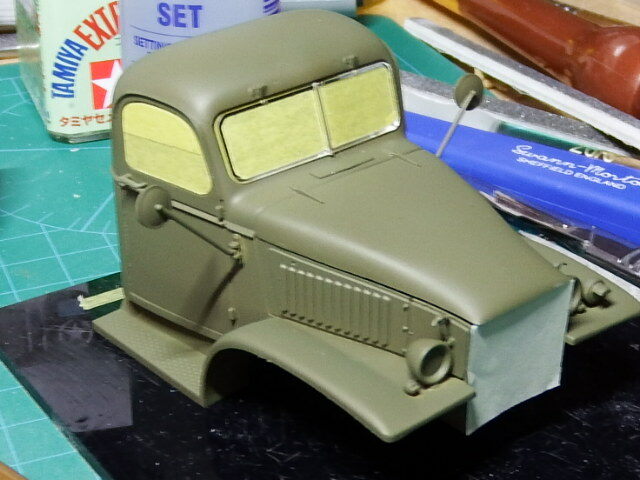 The windscreen has some masking applied which will remain until I apply a sealing varnish later on. 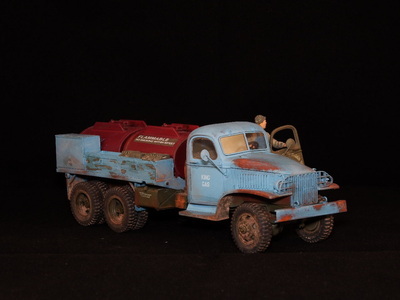 First there was a Wash with Vallejo Washes: The Cab & Truck bed in Blue Wash and the Chassis & cab door in Olive Wash which is then allowed to dry off. I arranged for a bent bumper and some fender damage on the left (drivers) side. 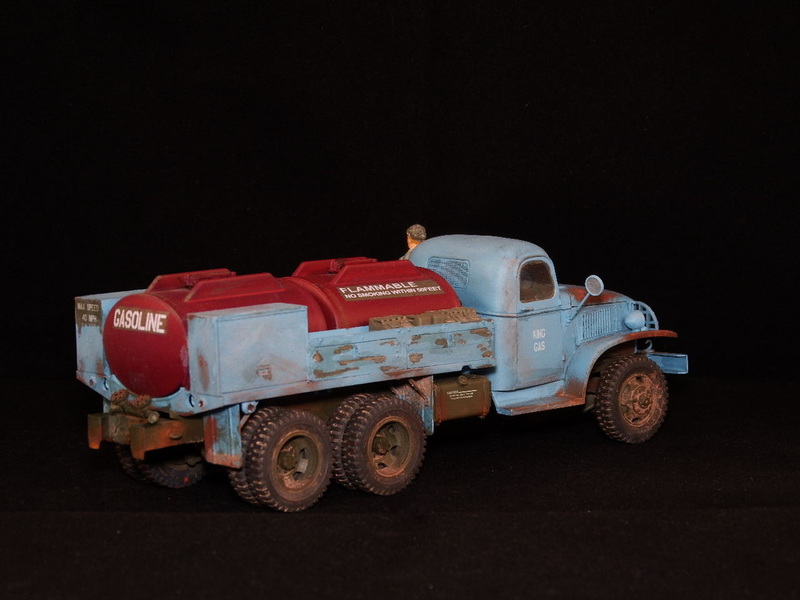 A mix of MiG Powders (Old Rust, Rail Rust & New Rust), were applied to give an aged look. 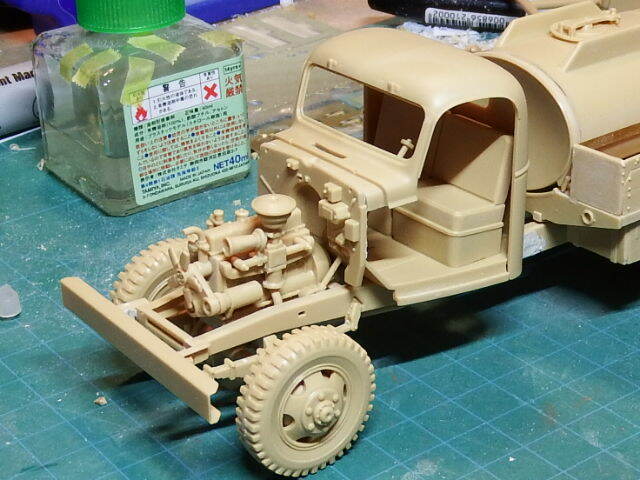 The earth weathering has come along with extra detail to the chassis and wheels. The use of MiG Powders is certainly having the desired effect. 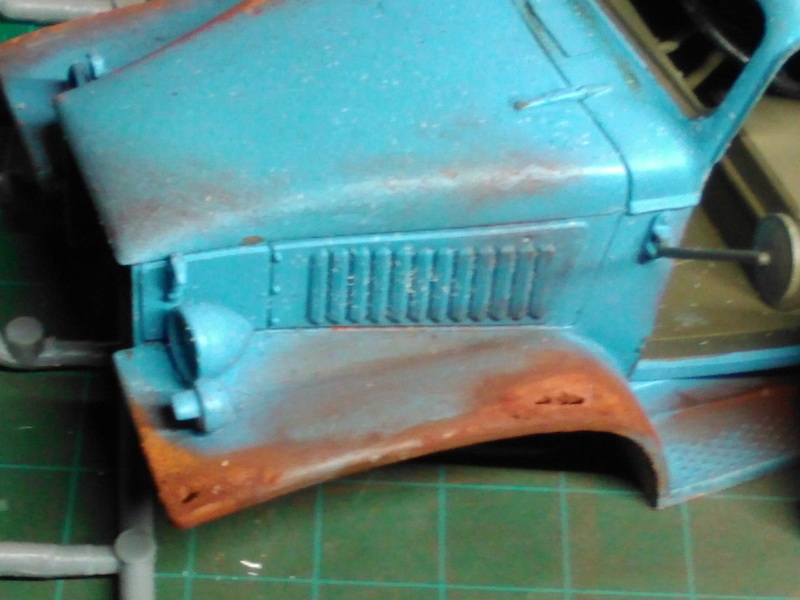 I decide to increase the level of rusting to the vehicle for added effect. Also, I've given the truck a Company Name using up some left-over decals so, it's King Gas. 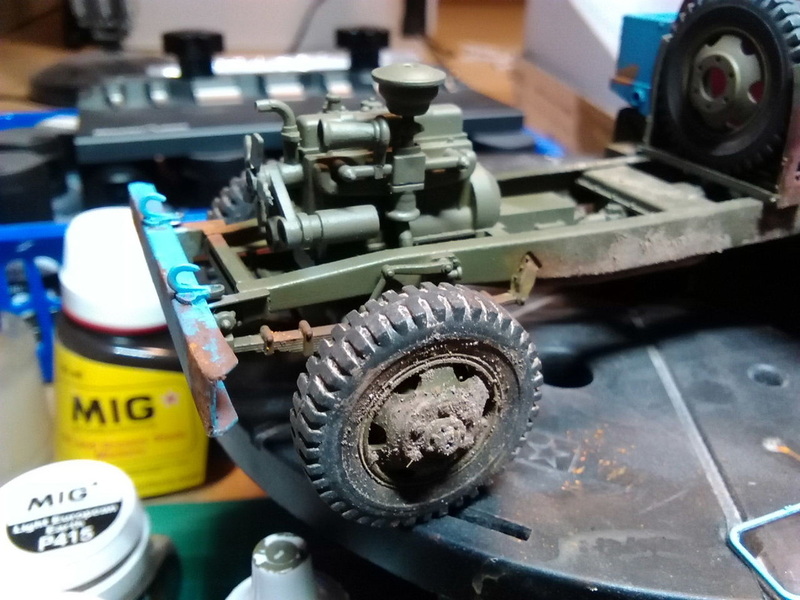 Additional heavy weathering continues at the rear of the vehicle with distressing the paintwork and wear & tear on the equipment. Well, here she blows! 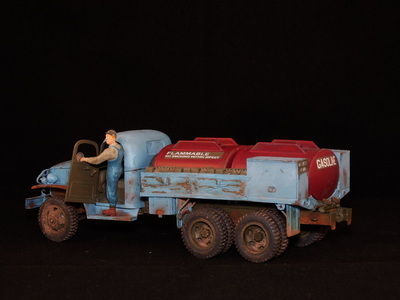 And with Jerry Cans loaded up too. I've made up 24 US Jerry Cans as a vehicle load. 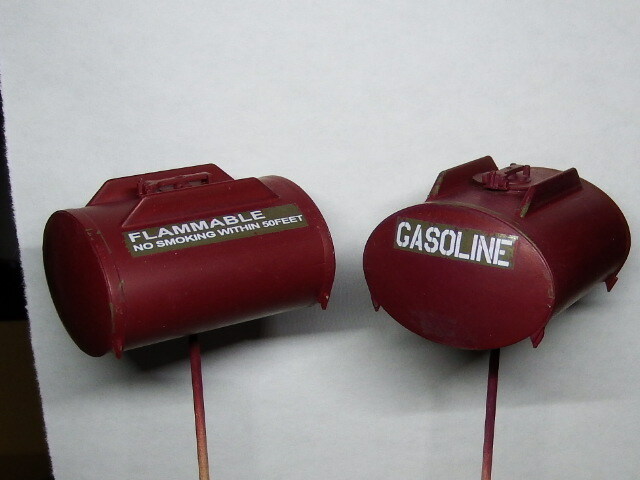 Built from the Italeri Set I sprayed them all Olive Drab, then varnished and applied minimal weathering and staining. WELL! here we are, finally! The model is D.O.N.E. This has taken me a lot longer than I had anticipated but, most of that is periods of not actually doing anything. Most of this delay is doing the figure which I haven't done that many. He isn't perfect but I got this far and decided to call it a day. 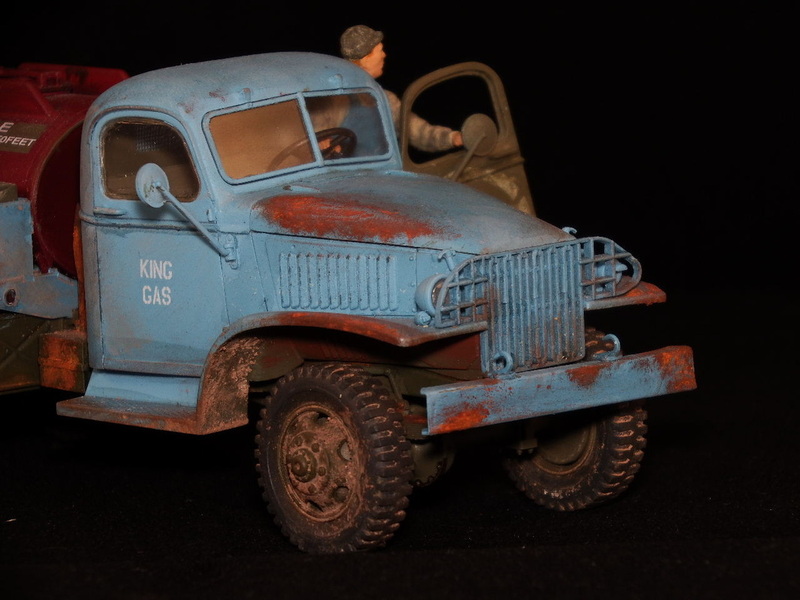 the juggling act on this final part was the fitting the figure to hold the steering wheel, have at least his left foot on the running board and his left hand on the door. Now that I see these final pictures, I am very happy with the overall outcome. Born into battle during World War 2 this warrior fought it's way across Europe with the 3rd Army and kept the Army Air Corps fighters fueled. But, as with all old warriors and with the wars end it was put out to pasture. It's now 1949 and along comes Army Mechanic PFC Alvin King, demobbed from occupation duties and now an ex-GI looking to use his GI Bill to start a business. 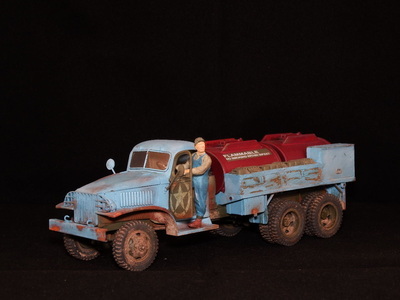 So, he looks for a truck to keep the locals back home supplied with fuel oil. On going to a surplus sale in Memphis he picks up this old tired tanker. She needs a little work, but it's a start! Using his old contacts at home he gets some contracts to deliver heating oil and starts to earn a steady income for himself and his new wife Milly. King Gas is born! 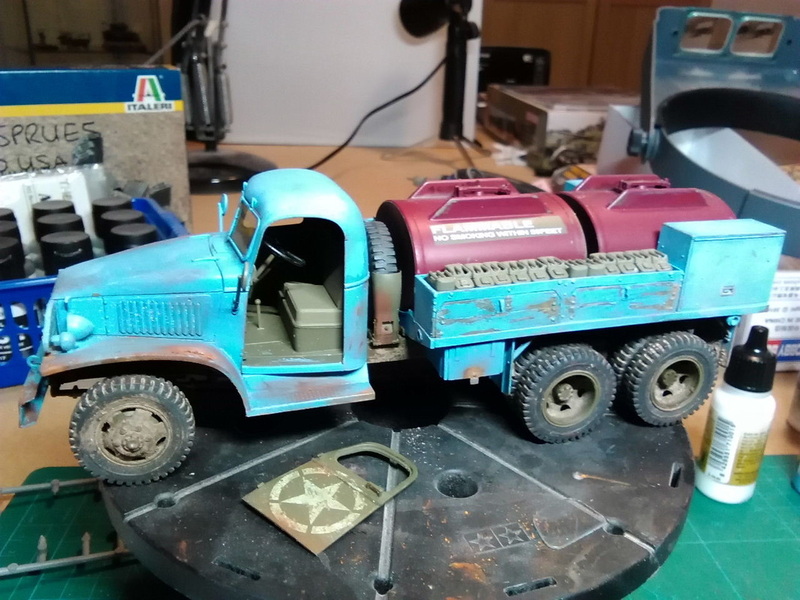 Alvin gets some surplus blue and white paint, mixes it together and paints the truck to cover up the now faded Army Olive Drab. 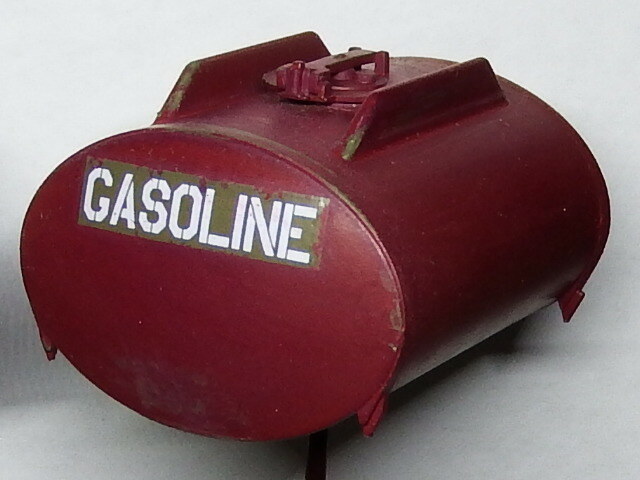 It's now 1951 and the fuel tanks have had their day, they're starting to leak and that's costing Alvin money. So, it was off to another sale at a scrap yard where he found a wreck of a truck but it had 2 good fuel tanks. He bought the tanks and had his own replaced. 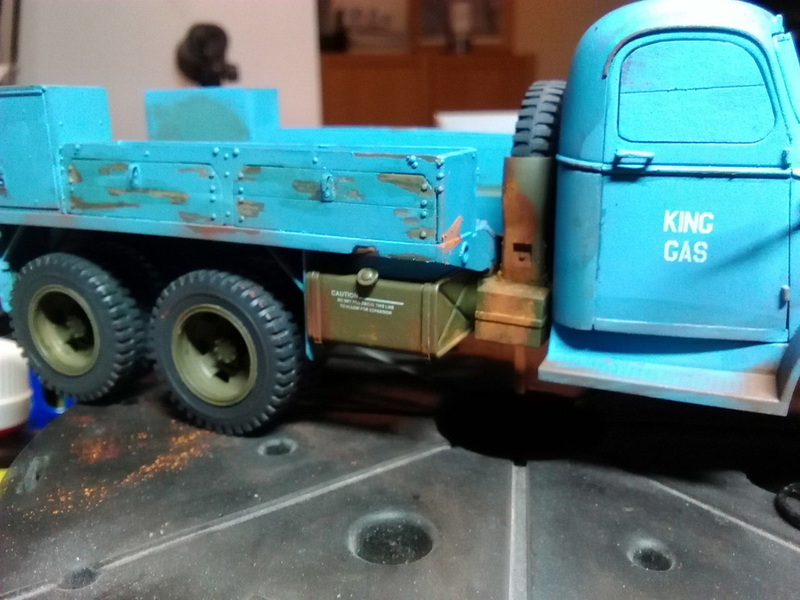 They were a hideous red colour but once he had them installed he had every intention of repainting them into 'his' distinctive blue colour – no more blue left! Milly had taken it for the house porch. While he was at the yard, Alvin also replaced the drivers side door and wing mirror damaged the year before. 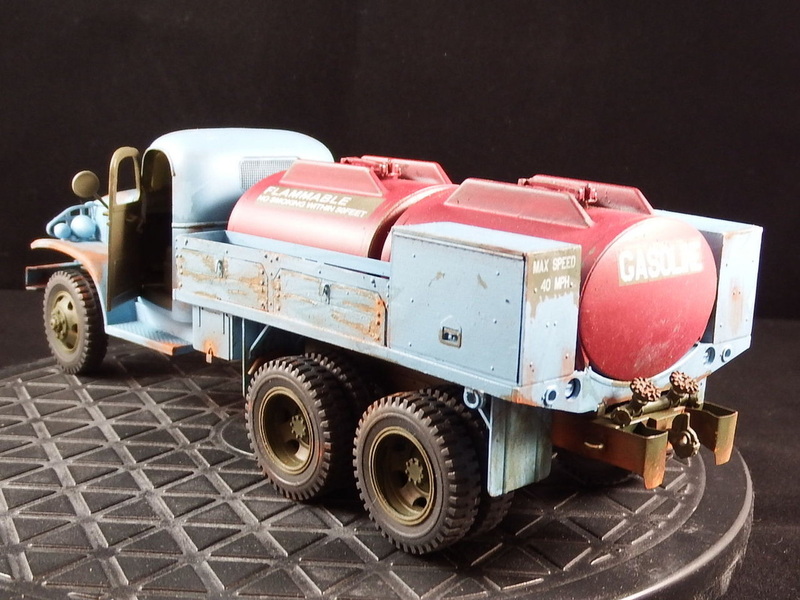 So, his fuel truck was now a mishmash of parts but he could still go about his work. He needs the work, he and Milly are looking to start a family but times are hard in the mountains. 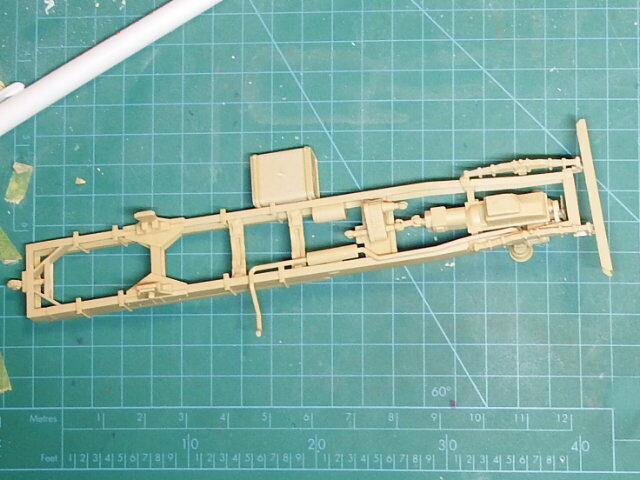 This model build was an exercise in weathering and distress but over the time of this build a story was born. 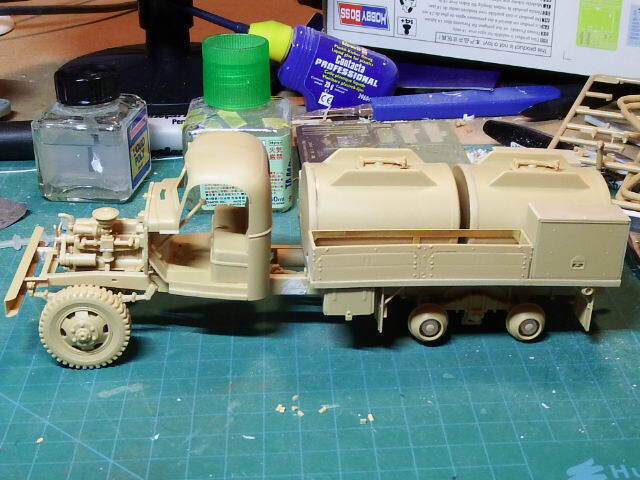 I used this story to place the model in context and with it came the amount of weathering needed. The story of Alvin is fictional but cannot be so far removed from the times that some of it must have a ring of truth to it. 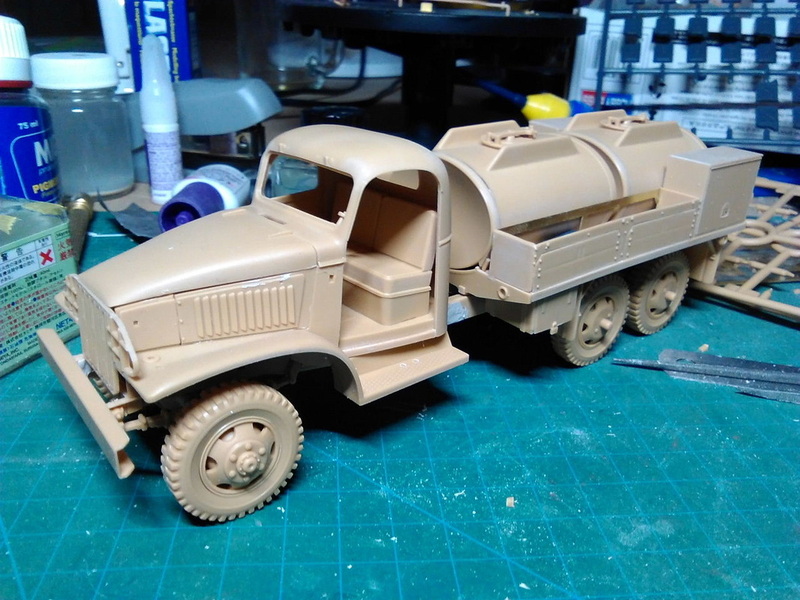 I hope you have enjoyed following this build and may join me again on a future project.